On the first day of Christmas, my true love gave to some new weapons under the tree. F.E.A.R. 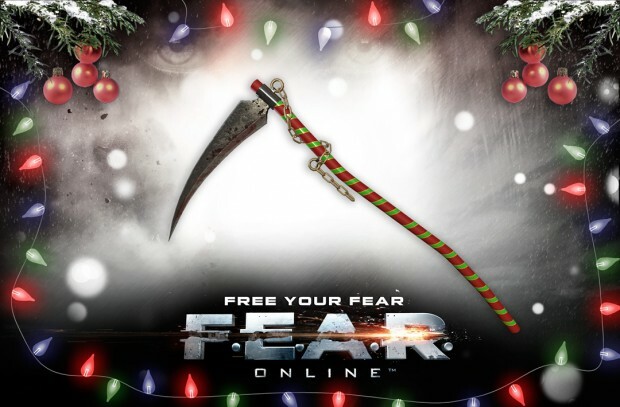 Online’s new holiday-themed update is now live, introducing a new game mode, a bunch of new gear, and daily log-in rewards. Armored Front is a capture-point map where players can use everything from grenades to ‘mechs to secure victory for their squad. A host of new weapons, such as the Vollmer Ultra92 Shotgun and the M4A1 SAS, are also available, and there are even some new psionic abilities… you know, in case Santa needs some “convincing” to move you from the “naughty” to the “nice” list. Finally, the Twelve Nights of Christmas event rewards players for logging in and also sends them out into the cold to find different skins and outfits to equip. Because nothing spreads the holiday spirit like blowing someone away while wearing reindeer antlers. How does this piece of turd got created in the first place? Anyone know?